They say it takes a village — raising kids in the age of technology has brought complex issues such as when to start giving students access to technology. With the increase of access comes more opportunities for dangerous trends like cyberbullying to wreak havoc on a young person’s life, sometimes even to the point of major crisis. Sadly, 12% of America’s adolescents have experienced at least one major depressive episode over the course of a year. Anxiety disorders affect 25.1% of children between 13 and 18 years old. Coupling these sobering statistics with trends surrounding cyberbullying paint a picture of being young in today’s age: Nearly half of young people in the US report being cyberbullied. 95% of teens who witness bullying on social media ignore it, letting it go unreported. 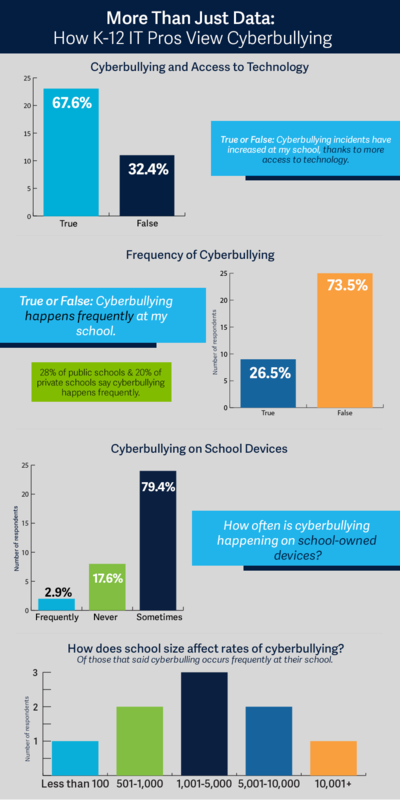 Lightspeed Systems, the leader in K-12 web filtering and device management, set out to survey IT professionals as well as parents around the country to learn more about cyberbullying today in schools. We asked critical questions: how often do you see cyberbullying happen at school? Which grade levels experience it most? Do you think it will increase or decrease in the future? Who should be held responsible for stopping online bullying? We drilled some of the key findings into an infographic below. Read on for the detailed findings and analysis. HOW OFTEN DOES CYBERBULLYING HAPPEN AT YOUR SCHOOL? We started by asking a community of K-12 IT professionals its insights into cyberbullying at the schools in which these professionals work. With an increase of student access to technology, such as laptops, tablets and smartphones, 67.6% of IT employees say incidents of cyberbullying at their schools have been on the rise, thanks to an increase of technology in the hands of students. It’s a delicate balancing act of providing students with the tools they need to learn in a digital age, as sadly, it’s apparent that this newfound access has opened doors to a rise of cyberbullying. Of the 26.5% of IT teams who said cyberbullying happens frequently at their schools, we dove into how the size of their school played into cyberbullying. Schools with 1,001 to 5,000 students ranked highest in incidences of cyberbullying. WHO GETS BULLIED? WHO IS THE BULLY? Growing up is hard today — as students move up grade levels, they continue to encounter new challenges along the way. On a personal level, anyone who has been through a school system can think back on the events, classmates, and teachers who made life at that time great — and sometimes difficult. We asked IT teams to report on which grade levels were responsible for cyberbullying others. Vice versa, we also wanted to know which grade level was most frequently targeted by cyberbullies. Survey responses indicate that seventh graders are the most frequent victims and perpetrators of cyberbullying. For victims of cyberbullying, 6th and 9th grades tied for second place, followed by 8th grade. For those responsible for bullying, 8th and 6th grades came in second and third places, respectively. What happens after an IT team member witnesses an instance of cyberbullying? 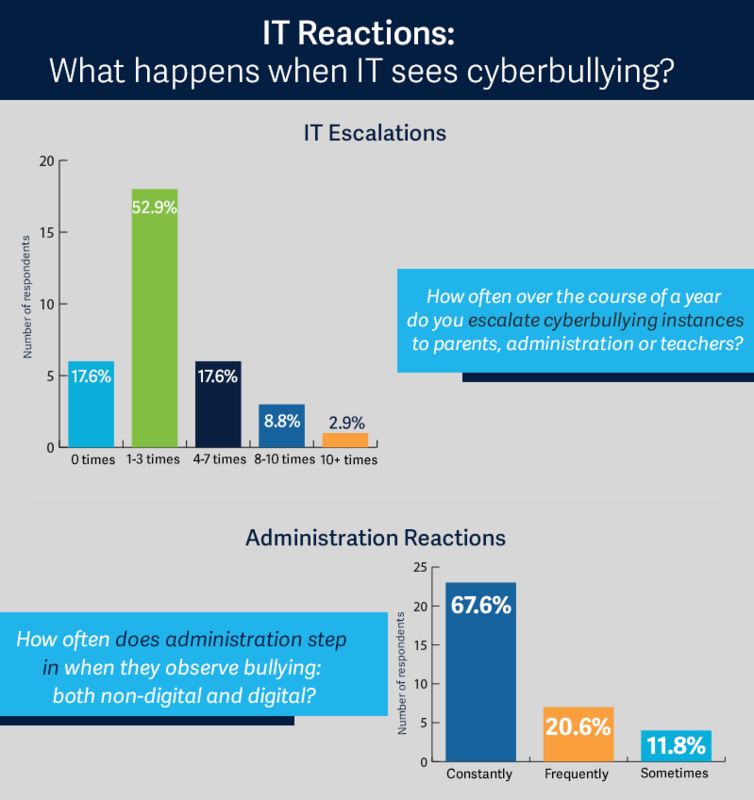 Over the course of one year, more than half (52.9%) of IT professionals escalate any instance of cyberbullying over the course of a year to administration between 1 and 3 times. Interestingly, 17.6% said they never escalate a problem to the administration. More research is needed in this area to discern why that is the case. When asked how often administration steps in when they observe bullying or cyberbullying, 67.6% of those employees say they step in “constantly.” We conducted this survey asking how often administration steps in to intervene in instances of cyberbullying and non-digital bullying as two separate inquiries, and the answers for both were exactly the same. In other words, K-12 IT employees report that administration will intervene in instances of bullying and cyberbullying with the same regularity. Tracking user activity on devices at school is key to understanding how students are leveraging the provided technology to advance their learning. We asked our community of IT pros if they are tracking user activity, as it pertains to cyberbullying, as much as they’d like to. The vast majority (67.9%) said they are tracking as much as they’d like. Budget and resources are always a challenge, and interestingly enough, 68.1% of IT teams made up of five or fewer employees said they are happy with their tracking abilities. We wanted to know if they are using powerful reporting data to track activity in an attempt to curb cyberbullying. 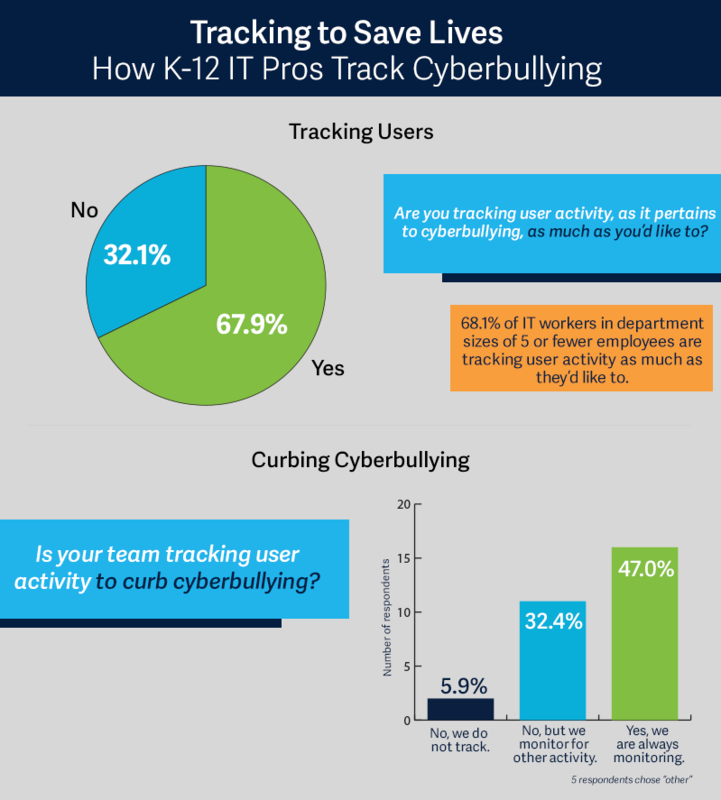 47% of IT pros said they are always monitoring for this activity while 32.4% are tracking but may not have cyberbullying prevention on the forefront of their objectives. 5.9% of respondents are not tracking activity. Again, more data is needed to draw solid conclusions. When monitoring for flagged terms and suspicious activity, having those alerts be visible at the moments they occur is essential. That’s why Lightspeed Systems Relay integrates real-time alerts to help IT teams receive notifications for possible dangerous or suspicious searches or other online activity to review at a moment’s notice. Learn more about real-time alerts here and other cyberbullying prevention tools from Lightspeed Systems. 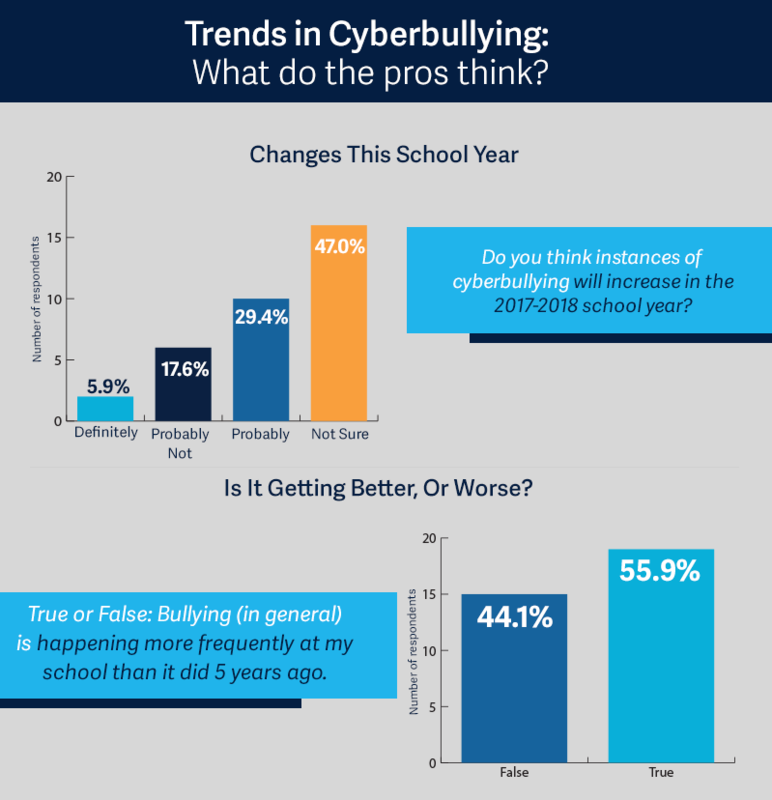 When asked if they thought instances of cyberbullying will increase this school year, the respondents were candid. Sadly, nearly one-third think it will probably increase with nearly 6% saying it will definitely increase. 17.6% said it would not increase. Thinking back over the last 5 years, 55.9% said bullying, in general, is happening more at their schools, a near 50/50 split from those who said it was not happening more often. Cyberbullying remains a problem and concern for K-12. We asked parents to compare the negative impact of cyberbullying five years ago to its impact today. When asked if cyberbullying is a bigger problem today for kids than it was five years ago, 95% of parents said it was. Would you rather limit a child’s access to technology than give them a chance to be a victim of cyberbullying? It’s a tough choice for many parents and every situation is different. When parents were asked if they would rather limit access to technology than open their children to cyberbullying, 74% said they would. 95% of parents said social media perpetuates cyberbullying, yet interestingly, 51.8% of parents with children who fall into an age group that would currently attend a K-12 school (6-18 years old) allow their children to use social media. WHO IS RESPONSIBLE FOR ENDING THE CYCLE? Parents and guardians play an essential role in a child’s life. We surveyed parents in addition to IT team members to get their opinions on what they see in their childrens’ lives today as it pertains to access to technology for young people and cyberbullying. 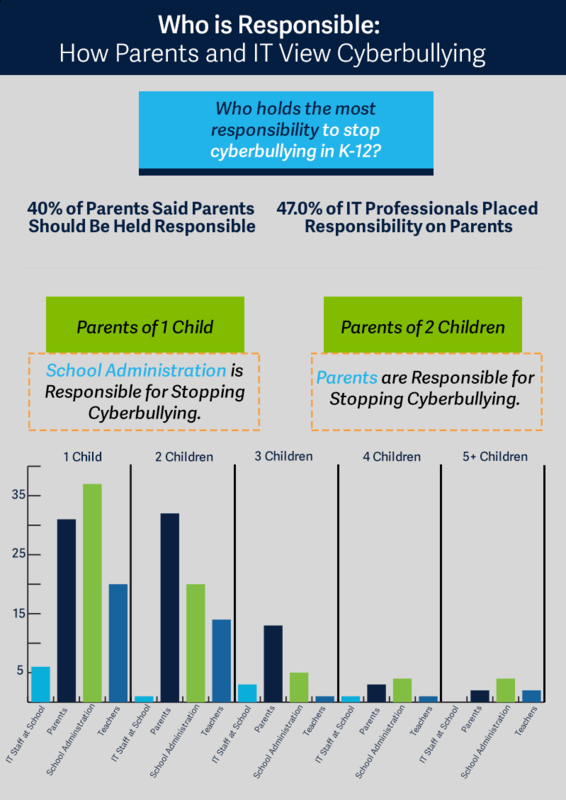 We posed the same question to IT professionals in K-12 as well as parents: who holds the most responsibility to stop cyberbullying in K-12? 40% of parents and 47% of IT professionals placed that responsibility on parents. When we dove more deeply, non-IT parents with only one child put school administration as the #1 most responsible party for stopping cyberbullying in K-12, but parents of 2 children said it was a parent’s duty. Opening up a dialogue and talking to kids about cyberbullying is an opportunity for parents to help their child if they are involved with it. When asked if they had talked to their kids about cyberbullying in an attempt to help them avoid being a victim or reporting instances of it when they see it happen online, 77% of parents said they have. 79.3% of female respondents said they have taken this action, versus 72.5% of male parent respondents. 27.5% of parents say they are not worried about what their children are viewing online. 12% of 12-17 year olds have admitted to cyberbullying others in their lifetimes. For many young people, social media can be a gateway to unwanted attention and damaging comments made by peers. Cyberbullying is a consequence of increased access to technology for young people that schools, parents and students themselves must take seriously to help curb instances of cyberbullying now and in future years to come. For now, it’s clear that IT teams must remain diligent, and continue to monitor and track student activity to help students and avoid potential crisis situations. While there are many individuals that can help children who are victims of cyberbullying, the combined efforts of parents and school employees are key. It’s the duty of an IT team to be tracking user activity holistically, no matter where students are using school devices. 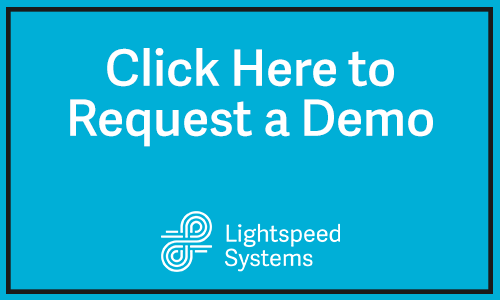 Lightspeed Systems leverages two decades of web filtering experience and powers robust solutions to keep students safe and on-track with their online learning. Ready to make the switch to cloud filtering and cover all of your devices, no matter what OS they are or where they are? Relay is set up in 15 minutes and gives IT complete control over a 1:1 deployment. Get real-time content analysis and flagged activity reports right at your fingertips while keeping your deployment ROI high with lost or stolen device geolocation. SSL decryption is seamless, requiring 0 PAC Files, trust certs, or proxies. Get up and running fast and keep your students protected. For our IT responses, we sent the survey to our community of Lightspeed Systems customers and non-customer K-12 IT professionals to answer. A total of 34 IT professionals working in K-12 responded. Then, 200 parents were also surveyed in a separate, additional survey. Responses were collected throughout the month of September 2017.